Eating right can be difficult in this face paced world where you are tempted by greasy, unhealthy foods at every corner. Everyone knows about the “food pyramid” and to eat your fruits and veggies everyday, but there are five important foods that men and women should eat everyday for optimum health. 1) Spinach & Leafy Greens – Not only does Popeye’s favorite vegetable pump up your immune system, but these dark green cancer fighters are loaded with vitamins and strengthen bones, not to mention they help you to fight off sickness. A definite must-have when it comes to your daily diet, leafy greens are at the top of the to-do list! 2) Bluberries – Round, delish and blue, these miracle berries are magic when it comes to preventing ulcers, warding off heart disease, lowering cholestorol and fighting all types of cancers. Number one when it comes to antioxidants, blueberries keep your mind sharp and your brain in tact. 3) Apples – You know the old saying “an apple a day keeps the doctor away” and it’s still true today! Apples are loaded with fiber and are superfoods in keeping your cholesterol lowered and at reducing the risk of heart disease. Another plus, the more you bite into these crunchy fruits, the better your teeth look! 4) Walnuts – No kidding! These are the top nut when decided on which nut to chews, I mean choose! Walnuts contain more Omega 3 fatty acids than salmon and are full of muscle building proteins. Keep these nuts in your desk and car as a snack to keep the munchies away. 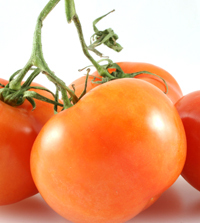 5) Tomatoes – Full of lycopene, tomatoes are tops when dealing with cancer and keeping your body fit and free of disease. Whether you drink it or eat it with a heaping helping of pasta, tomatoes are the veggie of choice when deciding on what you’re gonna have for dinner!